I have been doing some enthusiastic research on the topic, and I have come to realize that most of the current corporations and governments are not being able to provide enough jobs for the hundreds of thousands of young Arabs who graduate every year. Besides, those amongst them that were planning on emigrating lost their chance to travel to the US or Europe for dream jobs due to the economic downturn. With 60% of the Arab nation being under 30 years old, the number of educated individuals is rising, and yet the supply of jobs is inadequate. In this context, numerous institutions, banks, and government agencies are focusing on fostering entrepreneurship among youth. Consequently, hundreds of startup projects and initiatives are being launched annually by young entrepreneurs who have the education, the idea, the drive, but lack the experience and the systematic approach to enhance their chances to succeed in their ventures. This gap has certainly led to numerous failed initiatives, shattered dreams, and lost investments. Imagine all those young aspiring youth, full of enthusiasm and creativity, but crushed by their own inability to drive their business enterprises to success. The fact is, good ideas are a dime a dozen. The true value is in the ability to transform those ideas into reality…and rare are those that have the intrinsic knowledge to go through the process. In this context, I have realized that project management skills, knowledge and tools come in very nicely to fill a gap for the aspiring entrepreneurs and empower them to be able to transform their ideas into a reality. Ability to clearly define the scope of their startups, products, services and communicate it clearly. Knowledge of how to break down the scope of work into clear and comprehensive work packages, schedule the work packages, and work on a budget accordingly. Skills in recruiting the right people, engaging them, and motivating them to work synergically. Communication skills with main focus on unifying terminology used, choosing the proper communication channels, and disseminating the right information. Expertise in understanding possible risks that are inherent to new ventures and ways to manage them. This usually becomes better with time…trial and error being the best tutor. That’s what I have in mind so far, I hope it helps. Knock them out! I’m going to share with you some of the things I’ve realized about leadership in the several places I’ve volunteered/worked…and I believe they do apply, more or less, at all levels and in all kinds of organizations whether for profit, non profit or governmental. Vision: A leader without a vision is like a captain sailing a ship into oblivion. Without a clear direction, a goal or even a dream…that person is not leading but merely managing the work being done without giving much value to why is it being done, how and what for. Trust: This has proved to be so essential for anyone to be a leader, he/she needs to be trusted and to be able to know how trust others. Without that sense of trust, the leader will quickly loose ground and wont have a team to work with. Transparency: If the leader is not clear with those he’s working with then they will lose interest, have distorted ideas of what needs to be done, and they most probably will not have a shared common goal. Stability: A leader needs to be to stable and strong to be able to support his/her team. Without that stability, both he/she and his/her team will crumble sooner or later. Stability comes from several factors…from within, from the society, from family, from work, finances…etc. Thus it is tricky to strike a balance between it all and manage to be as strong and stable as a mountain. Competence: Any leader who is not found to be competent and able to implement work properly, he/she will not be able to lead a team. Being able to lead others by example proved to be one of the most effective ways. Thus sharing the successes and achievements he/she has done and can do in the future will raise the moral of his/her team and provide guidance. 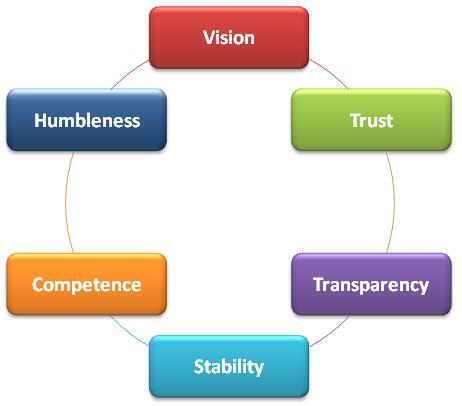 Humbleness: A leader’s ego can lead to his/her downfall if it is not checked and trimmed often. The leader needs to keep his/her feet on the ground, always treat others as equals and make sure that how he/she acts/talks does not reflect any bossy-attitude, arrogance or a sense of superiority. Everyone on the team is equally important, respectful and worth giving the attention of the leader to develop and grow. I know those aren’t much, but after my personal reflections those seemed to be the most obvious and note-worthy qualities that a person needs to have to be able to lead.